The WORX BladeRunner is the perfect tabletop saw for light-duty sawing in wood, metal, ceramic tile, aluminum, and plastic. Carry the saw to your worksite, rather than carrying materials to the saw. This portable table top saw is a must have for any DIY project. In the past, you would need multiple saws to perform rip, scroll, miter & inside cuts - but not anymore. The BladeRunner X2 includes 5 assorted t-shank blades for cutting wood, ceramic tile, aluminum & metal. Blade changes take just seconds, so you can quickly go from cutting ceramic tile for your bathroom to cutting wood for a homemade picture frame. The BladeRunner X2 boasts a small & compact size, but also features a large rip fence and hold-down guard & splitter for improved control and wider cuts. The onboard storage compartment holds your blades and accessories, while a built-in tabletop handle makes your BladeRunner the go-to saw that goes anywhere. No, this model does not come with a battery or charger. This is an electric tool. How is the Worx Bladerunner Portable Tabletop Saw different than a typical saw? Typical table saws are big, bulky, and difficult to transport out of the workshop. The Bladerunner is different. A unique, compact, and portable tabletop saw, the Worx Bladerunner Portable Tabletop Saw blends the cutting characteristics of a table saw, jigsaw, scroll saw and bandsaw and lets you take the workshop to the job site. Stop struggling to make the right cut while trying to control both your work piece and maneuver the saw. The Bladerunner’s tabletop gives you a solid support surface for your materials while giving you full, two-handed control of a variety of cuts – scroll, cross-cut and even rip cuts. Using standard T-shank jigsaw blade 4” long or less allows you to customize your Bladerunner for the job at hand, whether that’s wood, metal, plastic or even thin-set tile. Easily take the best of your workshop to the job, instead of the other way around. Is the Worx Bladerunner battery operated or electric? The Bladerunner is a 5.5 Amp electric tool and has a 10-foot cord to give you the reach you need to skip the extension cord. What are the Bladerunner’s dimensions? The table size is 15-3/4” x 17” and the Bladerunner’s total height (with the arm installed) is 17”. How heavy is the Worx Bladerunner? The Bladerunner Saw only weighs 14.7 lbs which makes it extremely easy to transport between the workshop and job site. Don’t limit yourself to the workshop – take your workstation to the job and tackle a wider variety of projects. Does the Worx Bladerunner Portable Tabletop Saw ship assembled? To keep your shipping cost to a minimum, the Bladerunner does ship with minor assembly required. Attaching the guide arm and installing a blade will take less than 5 minutes and require no tools. You’ll be ready to cut before you know it! Are blades included in the Worx Bladerunner package? Yes, each Bladerunner Portable Tabletop Saw includes 5 T-shank jigsaw blades to get you started. Need more? Check out our 10-blade assortment pack, the perfect addition to your Bladerunner. What kind of blades to the Bladerunner Portable Tabletop Saw use? Do I have to use Worx blades? Worx offers a convenient 10-pack of assorted blades to tackle any job you’ll probably encounter. Need something faster or something not included in the assortment? The great news is that you can use any T-shank jigsaw blade that is 4” long or less. You can pick up any blade to suit the job at hand at your local hardware store for that project that just can’t wait. What is the Bladerunner’s stroke length? The Worx Bladerunner has a stroke length of 3/4”. What is the maximum cutting capacity for the Bladerunner? What kind of materials can I cut with the Worx Bladerunner Portable Tabletop Saw? Can I make internal cuts with the Bladerunner? Yes! You can make internal cuts on a material by first drilling a hole wide enough to accommodate the blade in the area to be cut out. Lift the guide arm and slide the material over the blade, then lower and secure the guard arm again. Once your work piece is stabilized by the pressure foot, you’re ready to cut! Can the Bladerunner make wet cuts for materials like stone, brick or tile? Wet cuts are not Bladerunner friendly. If you’re working through stone, tile or brick, we recommend looking for a wet saw or a tile saw to get the best result for your project. The Bladerunner can take you far, but some materials require specialized tools. Can the Worx Bladerunner make angle cuts? Can the Bladerunner make bevel cuts? 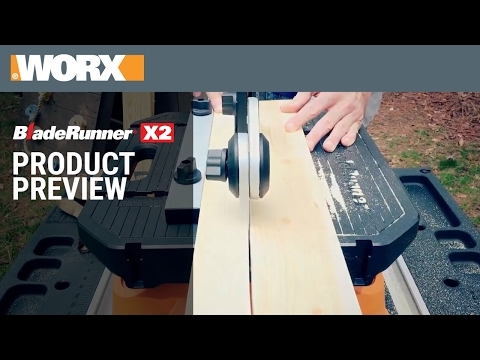 The Worx Bladerunner can make angle cuts and comes with a rip/angle guide to get the angle you need. Bevel cuts requiring the blade to move instead of the piece aren’t a good fit for the Bladerunner, but there are plenty of other Worx saw options to explore. There are three channels on the tabletop of my Bladerunner. What are these for? How do I install the rip fence and mitre gauge? The two parallel channels to the right side of the guide arm are designed to support the rip fence. Insert the two metal arms of the rip fence into the channels and slide the rip fence into place, tightening the two bolts on top to hold it in place for a secure, accurate cut. The single channel to the left of the guide arm is for the miter gauge. Insert the metal arm of the miter gauge into the channel, adjust the angle of the cut, align your material, and use the guide to guide your material through the cut. Does the Bladerunner have a dust removal option? What size vacuum hose can be attached to the Bladerunner? Yes! The Bladerunner’s guide arm has a vacuum attachment port for dust removal. The vacuum adapter directly accommodates a 1-1/4” hose, a common size for most workshop vacuums. I need to use an extension cord on the jobsite to operate my Bladerunner. What kind of extension cord should I use? Choosing the right extension cord is more than picking the right length to reach an outlet. The right extension cord will ensure you get the performance you expect and will extend the life of your 5.5Amp Bladerunner. To find the right extension cord, find the correct gauge for length you intend to use on this chart, or the one in your manual. Your local hardware store will be happy to help you select the right cord to meet your needs. How do I change the blades? Changing the blade on the Bladerunner is quick, easy and requires no tools! First, remove the safety key to prevent accidental starts (and unplugging any power tool before installing blades or making changes is also a good idea). Raise the guard arm, and place the blade holder over the top of the blade. Depress the red blade release button on the left side of the Bladerunner tabletop and slide it to the left. This will release the mechanism holding the blade and you will be able to easily remove it to install a new one, or release the button to close it for transportation. To insert a new blade, depress the red blade release button on the left side of the Bladerunner and slide it to the left. Holding the new blade with the blade holder, insert the shank into the Bladerunner with the teeth facing the front of the machine. While holding the blade in a firmly seated position, slowly return the release button back to its original position. Once the button is no longer pressed in, you can remove the blade holder, lower the guide arm, re-install the security key and get back to work. The Worx Bladerunner Portable Tabletop Saw even includes blade storage on the front of the machine. Keep your favorite five blades easily accessible where you need them - on the saw! I just installed a new blade, but it’s not sitting straight. How do I fix it? If the blade isn’t fully seated during installation, there is a potential that it can turn in the mechanism as the blade release button is disengaged. Fixing this is easy. Follow the instructions for removing the blade. With the blade release button still engaged, re-seat the blade and make sure it is completely inserted into the mechanism. Hold the blade firmly in place while slowly releasing the blade release button. Once the button is completely disengaged, release the blade and remove the blade holder. There are rollers in the guide arm, but the blade doesn’t touch them when working. How do I adjust them? The rollers in the guide arm aren’t intended to make contact with the blade during normal cutting, so they don’t need to be adjusted. They are there to protect both the machine and user if the blade is mis-aligned during improper cutting (cutting beyond blade capacity, without the proper use of the pressure foot). For complete operating information, please review the owner’s manual before using the Bladerunner. I can’t get an accurate cut with the Bladerunner. The blade wobbles while I try to cut. Why is this happening? This is a symptom that the material you’re cutting is thicker than the Bladerunner’s cutting capacity. Make sure you’re not exceeding the cutting capacity for the material you’re cutting by referring to the owner’s manual and ensure the pressure foot is adjusted securely against the surface of the working material. The guide arm isn’t something I’m interested in using. Will the Bladerunner work without it? The Bladerunner is designed to work with the guide arm and pressure foot, both for securing the material to the cutting table to get an accurate cut and to provide an added measure of security for the user. We strongly discourage removing the guide arm before using the tool and urge all users to review the full details in their owner’s manual before operating any power tool. Are there any precautions I should follow when using the Worx Bladerunner? Carefully review the owner’s manual for all safety information and guidelines for using the Worx Bladerunner. Follow safety precautions while using any power tools – including wearing safety eyewear, gloves, appropriate shoes & clothing, and keeping hair tied back. See the owner’s manual for complete safety instructions and details. If you decide the Worx Bladerunner Portable Tabletop Saw isn’t the right tool for you, we offer a 30-day Money Back Guarantee from date of receipt (less shipping and handling). Please call our customer service center at 1-866-354-9679 (WORX) and we’ll be happy to assist. View more information here. We know your tools are indispensable, so we cover each Bladerunner with a 2 Year Limited Consumer Warranty. You can extend your warranty to 3 years by registering online within 30 days of purchase. Already have your Worx Bladerunner Portable Tabletop Saw? Register now! Need more accessories? Many replacement parts are available on worx.com. You can also contact our friendly customer service team is ready to get you back up and running. Give us a call at 1-866-354-9679 (WORX). BladeRunner Portable Table Top Saw is rated 4.7 out of 5 by 123. Rated 5 out of 5 by Bobby C Second base from BladeRunner Portable Table Top Saw Great table saw...lightweight and easy to use. Rated 5 out of 5 by Tim k from Perfect size I've only had it long enough to use 3 times and it is a great tool.